"We've done away with the molds," said Pierre-Thomas Brun, assistant professor of chemical and biological engineering at Princeton and the principal investigator for the study. "We don't need a clean room or any fancy equipment, so engineers have much more freedom in the design process." Using a silicone common in medical devices, the team poured a thin liquid film over the surface of a plate, about the size of a compact disc, which they then flipped upside down for several minutes while the film cured. Without intervention, the liquid silicone congeals into an irregular array of droplets — much like the paint under a lid. 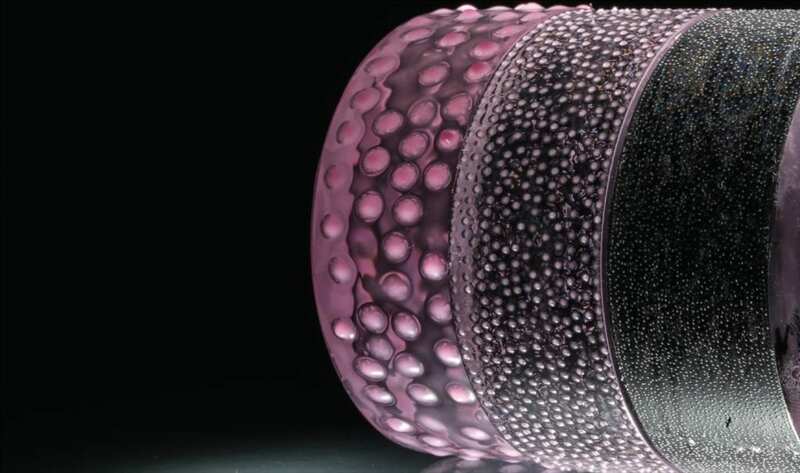 But by etching the plate with mathematical precision, using lasers to cut the marks, the researchers "seeded" the droplets into a lattice of perfect hexagons, each with a uniform dimension. "Gravity wants to pull the fluid down," said Joel Marthelot, postdoctoral research associate at Princeton and lead author on the paper. "Capillary forces want the surface to deform minimally. So there is a competition between these two forces, which gives rise to the length scale of the structure." More sophisticated versions of the experiment used a centrifuge in place of gravity, which allowed the team to vary the size of the drops with an indefinite range. Instead of plates, in this version they used plastic cylinders that look like clear hockey pucks. The excess fluid spun off and left their predictable pattern of cured drops. The technique worked down to the limit of their machinery, which produced a lattice of structures that were each around 10 microns, a fraction of the width of a human hair. The structures, which are prototypes, simulate the kinds of soft lenses that are a common part in smartphones. "The faster it spins, the smaller the drops," Marthelot said, noting that they could make structures even smaller than what they had achieved so far. "We don't really know the limit of our technique. Only the limit of our centrifuge." According to Brun, the kinds of mechanical instabilities that cause this behavior are usually regarded by engineers as a kind of nemesis. They are the physical thresholds that determine weight loads or heat capacities. "In this case," he said, "we took advantage of something that is normally seen as bad. We tamed it and made it functional by turning it into a pathway to fabrication." "One can envision a wide range of potential future application," said Jörn Dunkel, associate professor of mathematics at the Massachusetts Institute of Technology, "from drag-reducing or superhydrophobic surfaces to micro-lenses and artificial ciliary carpets." In addition to Brun and Marthelot, two other researchers contributed to the study: Elizabeth Strong, formerly a student at MIT and now a Ph.D. candidate at the University of Colorado, Boulder; and Pedro M. Reis of the Ecole Polytechnique Fédérale de Lausanne.